I was very interested in testing the new Specialized Turbo Levo HT Comp Fat bike for a couple of reasons. I’ve been riding a Felt Lebowske e-fat-bike since December of 2014 and I wanted to see how the e-technology has changed in two years. And I was also curious to try a hardtail again. I rode one once in the mid 90’s and it was the worst handling bike I’ve ever ridden and I never wanted to ride one again. But I always thought if you had to have a hardtail a fat bike would make more sense because of the extra cush the fat rear tire would provide. The bike was tested primarily on my private back yard singletrack. While testing it became clear that many folks have never seen an e-bike, I was asked many questions. One question I was asked a few times was, “where’s the throttle?” My answer was, the same place as your bike. This is a pedal assist bike. It has sensors that analyze the riders torque applied to the pedals and it has a speed sensor, the system analyzes the combination of the two to adjust the power output. Simply put, pedal harder, go faster. The speed sensor also prevents the bike from assisting once you hit 20 mph. At 20 and above you’re pedaling a 53 pound bike. There are three different power settings (all adjustable) that determine how many watts of assist are available. Using lower power settings will yield more mileage from the battery. Higher power will make the steeper hills easier. Specialized did a great job trying to make this bike look like their Fatboy and not look like an e-bike. Because the 36 volt 460WH battery is integrated seamlessly into the down tube there’s something most e-bikes do not have, a water bottle cage! (with a tiny tool kit!) The 250 watt (503 watt max) trail tuned German Brose motor is stylishly encased in the bottom bracket area. This bike is gorgeous! Lifting it into the car wasn’t fun. I put the bike on the scale when I got home. Whoa! A whopping 53.08 pounds! That’s about 5 pounds more than my Lebowske, but the Specialized does have a Bluto. A low hitch rack might be the best way to transport this beast, unless Sasquatch is around to lift it to your rooftop rack. The handlebars are uncluttered. There is no computer. The On/Off button, Up/Down for the Assist Level and 10 green LED’s that indicate Battery Level (10% for each LED) are located on the left side of the downtube. With the Integrated Trail Display on the left side down tube, changing power setting while riding is not advised unless you have magical gnomelike one handed riding skills. The stock pedals, Specialized Bennies with 4.5mm pins pedals are amazing! I’ve often heard of flat pedals that grip like SPD’s, but this is the first time I’ve ever met one that kept its word. But because I have no gluteus muscles, maximus, lateralis or medius I’m not able to get much power stomping on the pedal so I choose to use my SPD’s. I also like the Command Post IRcc 12 position micro-height adjustable dropper post. Not because I do any technical riding that requires it, those days are long gone. The dropper post allows me to get on and off the bike easier since my legs aren’t able to swing out and around the saddle during mounting and dismounts. When shifting to a lower gear the SRAM GX makes a loud crunchy sound that sounds like you just lost a few teeth on your cassette. This might be due to a lack of a shift detector in the Brose system. Many e-bikes (Like my Lebowske) have an electronic shift detector that senses when you shift and instantaneously reduces power for a micro second, resulting in smoother shifts and less strain on your chain. Eventually I learned to back off the pedals when shifting or shift while I wasn’t pedaling to avoid this annoying trait. The SRAM Guide R brakes with 200mm and 180mm rear disc’s do an incredible job of stopping this beast. It’s a good thing too, because when you point this 53 pound bike down hill it’s like a freight train and the powerful 4 piston brakes and big rotors are needed. The geometry is very similar to the Fatboy. It’s a racier geometry than I normally like but after a few hundred miles I grew to love the way it felt. This thing really loves to carve corners! I might put riser bars on it, but that’s it. May I Assist You? Lets go for a ride! Push the On button. Select desired assist mode, ECO – 20%. TRAIL – 50% TURBO – 100%. (European model may vary) Start pedaling. The first thing I noticed was a slight delay as the power came on and a slight lurch as it did. There was also a slight delay before the power shut off when I stopped pedaling. The motor felt more powerful and has more torque than the Bosch equipped Lebowske I am use to riding. These characteristics made for a longer learning curve than I was expecting. Part of the problem I later discovered was in the style of my own backyard trails. My singletrack is very tight, narrow, twisty, fairly flat and slow, and this motor in stock form is tuned for a faster, flow style trail. Eventually I learned the best (and most fun) way to ride this bike in tight singletrack is to put it in a middle gear and don’t shift. Ride it like a single speed and feather the rear brake for added control. Because the motor is so quiet, after a while you forget you almost forget it’s there. Tire noise and uncontrolled giggling drowns out any sound of the motor. It’s only when you start spinning at a higher cadence do you notice a high pitched electric motor sound. And even then, it’s not any louder than a leaf that gets caught in your frame and rubs your tire. I went out to test the battery mileage by riding to a local Rail-Trail and discovered the sensitivity of the torque sensor it not very precise at slow speeds. On flat ground while pedaling easily with just enough torque to keep moving at a casual pace like I normally do, the assist would shut off, so I’d have to pedal a bit harder for it to come on again. Keep repeating this process every ten seconds and it got quite annoying. When the power goes off, the 53 pound bike becomes very noticeable. I was’t out to go fast, I just wanted an easy cruise. I ended up going 40 miles and used 60% of the battery in and 3 hours and 15 minutes of riding time (12.46 avg speed). This is not the bike to ride if you plan to go slow and easy. It did not exhibit this trait while riding singletrack. If you want to go slow on this bike, ride it with the power off. So, the bike doesn’t like going slow, and you need to adjust your riding style to ride the bike on tight, twisty trails? Maybe not! If you have a smart phone (iOS or Android) or Garmin Edge 1000 GPS, Specialized created an app that allows you to customized the assist power to fit your riding style or trail! Unfortunately, I do not have a smart phone or a Garmin Edge so I was not able to test this feature. But here’s what you can do if you with the app. The power output for each of the Assist Modes, ECO, TRAIL and TURBO. The bike will remember the changed parameter settings after the Mission Control App is turned off. And if you don’t have the app and want to change the settings I understand you can have your Specialized dealer do it for you. Smart Control. – This feature lets range anxiety disappear! The Smart Control algorithm allows you to set your desired ride time, distance, or location and will adjust the motor & battery output accordingly for you. Navigation – The app includes a comprehensive navigation (POI, search address, language coach and previous rides) in combination with an extensive and customizable board computer. Connectivity – STRAVA integration and automatic upload opportunities to dedicated E-bike segment. Diagnose – A comprehensive diagnose system gives you immediate feedback and an overview of the motor, battery and system health. Ride History – Gives you a detailed overview of your fitness and ride history. And there’s a power meter that will show you how many watts you supplied and and how many the motor supplied. If you have a compatible Garmin Edge GPS there are even more features! I did some lurking on the mtbr.com “Official Specialized Turbo Levo and Mission Control Thread” and discovered most riders are dialing down the power to get more mileage. Nobody was using TURBO at 100% and most had changed TURBO to 50% or lower. An optional 504Wh battery is available that would provide even more mileage. It takes 3.5 hours to fully charge the battery and you can either charge it while it is still on the bike or remove the battery from the frame and charge it indoors. I always charged the battery on the bike because removing the battery requires unscrewing the thru axle style fastener and it’s much quicker to just pop open the charging port door and attach the magnetic charging cable after every ride. The battery weighs a little over 6 pounds (claimed weight, although I saw another review that said it was 9 pounds) in case you were thinking about carrying a spare with you and going for rides longer than 40 or 50 miles here in the midwest. Mountainous areas will see shorter mileage. I only got to ride the bike once in the snow, when we got about four inches of wet early December snow and the bike seemed to handle well. One thing e-bikes are great for is trail grooming. When snow conditions are tough and barely ridable, riding to pack the trail becomes fun instead of an exhausting and torturous feat of fitness and strength. I am able to ride enough laps on my backyard singletrack to pack the whole trail and still have enough energy to go back out and snowshoe a few spots and make some sections wider. For more on e-bike trail grooming adventures stay tuned, as Gomez is planning to test this bike pulling a groomer! (If we get enough snow this year) I also have plans to pull one with my Lebowske. After putting over 400 miles on the Specialized Turbo Levo HT Comp I was falling in love with it. This puppy loves to carve corners. And the 100mm Bluto changed my mind about hardtails, this was just a hoot to ride! The ability to fine tune the system to your riding style or trail system with the Mission Control App should reduce the minor motor quirks and make the bike even more enjoyable. The motor is so quiet you often forget it’s there, until you start climbing with the ease of Ned Overend and then remember you’re not Ned. Thanks for the review. I own a Specialized Turbo-X and have been eyeing this bike for some fat tire fun. I’m hoping they’ll update it in a year or so and put these on clearance. Got my X for $1700 below retail when they discontinued the model year. Seems like they’re just slapping a 2017 year on last year’s bike. Any chance you checked the bottom bracket sticker for manufacture date? One thing I love about Specialized is they really strive to make electric bikes that ride and feel like regular pedal bikes and not some hybrid moped contraption. I did not look for a manufacture date on the bike. As far as electric bikes that ride and feel like regular pedal bikes, you might want to try a bike with the Bosch system. The Bosch is far more response than the Specialized Brose unit and feel much more natural. But, perhaps the adjustments that can be made using the Specialized Ground Control App will make it feel more pedal bikeish. But in stock form the Bosch is much better at making it feel like you’re on a standard bike. But the extra power that the Levo has is also very nice. I wish you wouldn’t review motorcycles! If you put an electric or gas motor on a bicycle it becomes a motorcycle with pedals. They used to be called mopeds. Calling it an e-bike doesn’t make it a bike. Making it electric doesn’t make it good for the environment because that electricity is made by burning fossil fuels or nuclear power which are not good for the environment. Riding an e-bike does not provide as much exercise and is therefore not as good for your health. In addition, e-bikes don’t make particularly good bikes nor do they make good motorcycles. You probably wouldn’t enjoy pedaling it with the motor off. And if you are not fit enough to pedal a Fatbike, you would probably enjoy a regular motorcycle better. E-bikes are not good for the environment, not good for your health, and not good bicycles. I will concede that electric motorcyles that are quiet and don’t spew noxious exhaust would be an improvement over gas powered motorcycles The reason I read your website is because I am interested if FATBIKES not motorcycles. Please stick to what you do so well!!!!! We do what we want. We write about whatever we want. We publish whatever we want. Who exactly appointed you as the word police? Let me assure you that you have no police powers here. Furthermore, nobody has a gun to your head or their hand in your pocket, to make you visit, click or read any of our FREE content. If you find the e-bike stories offensive, simply don’t click on them. Mark likes electric motorcycles, but doesn’t like e-bikes? Electric motorcycles are worse for the environment than e-bikes since they use significantly more of that fossil fuel/nuclear energy to travel the same distance. And e-bikes let you add your own power to the drive train making them even more efficient. How much energy does Mark think e-bikes use? Even if one was to use this Levo being reviewed to its fullest battery capacity 365 days a year; at 10 cents per kiloWattHour, it use less than $20 per YEAR in electricity. Motorcycles and mopeds also require insurance, licensing, and registration tax. That, and they’re restricted to the same roadways as cars. You can’t legally hop onto a bike trail with an motorcycle or moped. As JB said, e-bikes are going to just keep gaining popularity. They’ve taken off with huge success in Europe and China. If you don’t like e-bike stories, I feel sorry for people like Mark. I ride bicycles, motorcycles and ebikes of all kinds and have done so for over 40 years (ebikes just recently). There is a huge sweet spot for ebikes in between bicycles and motorcycles. Ebikes are way more fun than bicycles and you can get just as much exercise…you just go faster. Ebikes are better for the environment as you are much more likely to ride to and from your favorite venue rather than haul your bike on your car or in your truck. I live on top of a mountain just south of Salt Lake City and I rode last year with a fat bike in the snow and this year with a fat ebike. 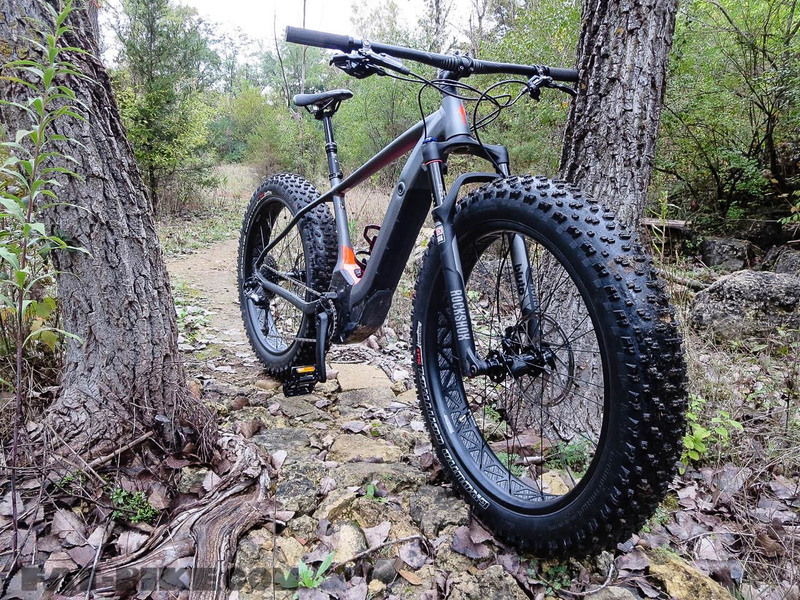 I will take the ebike 10 to 1 over the standard fat bike. And no, it isn’t because I am out of shape…blah blah blah. Over the next 10 years, ebikes will proliferate dramatically. When an ebike replaces a car for transportation, which it is much more likely to do than a bicycle, it will be a boon to the environment. People like my sister, who quit riding bicycles do to medical problems, will be back on ebikes having a great time and getting needed exercise. People who refused to buy into the carbon fiber-lycra-clip in paradigm will ride safer, more comfortable ebikes and they will be able to walk into a store or office in regular shoes when they get off their bikes. As for me, I will be silently riding over 100 miles on my fat ebike in southern Utah through sand, etc. with virtually no pollution where only motorcycles and atvs could go before.